One of the biggest issues in the world today is mental health. Many people are still afraid to discuss their battles with depression, anxiety and other disorders. Among men in particular, there’s a stigma attached to it, as we don’t want to be perceived as being ‘weak.’ As someone who’s suffered from depression and anxiety, I can admit I used to find it very difficult to talk about what I’ve experienced. But that’s changed. An outlet that’s helped me is comics and cosplay. Dressing up has allowed me to be part of a supportive community who are up for a laugh and it’s made me think of the positive mental health benefits of cosplaying. Cosplaying gives you the chance to become your favourite character. It’s a creative outlet that allows your imagination to take over. 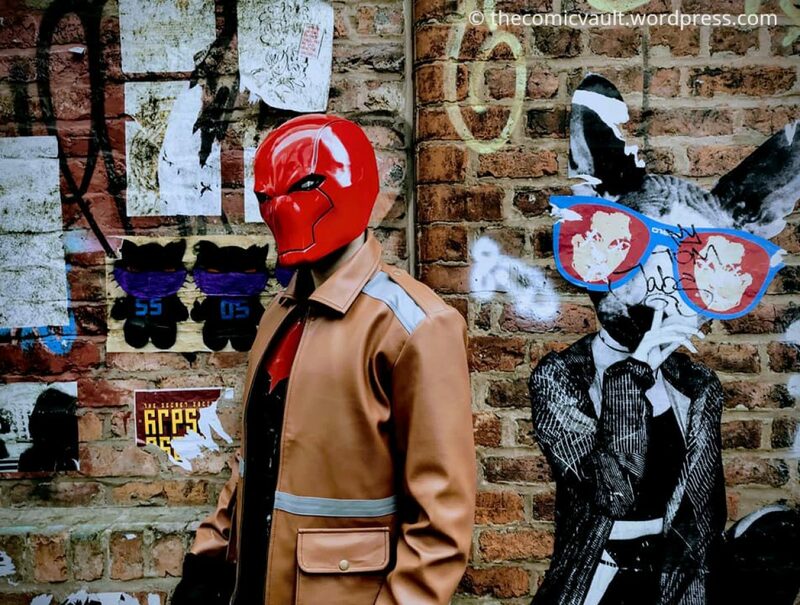 This year, I’ve cosplayed Jason Todd/Red Hood because I identify with the character’s journey. Jason is a survivor, someone who could be considered damaged goods. But even with his trauma, Jason has been able to do more than survive. He’s been able to make a life for himself and stand as his own man. I find that inspiring, and by cosplaying the character, it helps to remind me of my inner strength. I’m still here. I’m here for a reason. I believe I’m bigger than my past and can embrace the moment. Cosplaying helps me do that. There’s a freedom in cosplaying that means you can be whoever you want to be. For a few hours, you can leave behind the stress of a normal day and focus on enjoying a different side to life. Cosplaying makes me happy because there’s no judgement in how you want to dress or act. Everyone is connected by a love of popular culture and it shows in every conversation. If you’re not a fan of big groups, then people will come up to you and simply ask a question. They’ll come to you because they appreciate the effort you’ve put into your costume. Cosplaying is the chance to be part of a friendly community. It doesn’t matter whether you’ve bought a costume or made it yourself. What matters is how it makes you feel and that you can draw strength from the character you’re portraying. I’m very interested in hearing the stories of other cosplayers and how they think dressing up can benefit mental health. If you’d like to tell your story or want to be interviewed, please contact me at ryderj09@hotmail.co.uk or use the contact form. I agree. Cosplaying is a great ouitlet to help when you are struggling with a problem. This past April, for the 1st time one of my best friends dressed up in cosplay and we went to C2E2 which is a convetion in Chicago. She’s been a recluse for a few years battling really bad anxiety among other health issues. I was so happy and porud when she stepped out of her comfort zone and she had a blast. Yes, we left early because it was getting overwhelming for her, but she’s already pumped about going again next year! I am glad to see that others are also finding comfort in cosplaying. I’ve never done a cosplay before, but I really want to get brave enough to try a Lightning one someday!